Arkells new album Rally Cry is the band’s most pointedly powerful effort thus far. Long known for their exceptional songwriting and high-energy performances, the Hamilton-based quintet – singer Max Kerman, guitarist Mike DeAngelis, bassist Nick Dika, keyboardist Anthony Carone and drummer Tim Oxford – reveal on Rally Cry an unheard soulfulness that elevates their new songs to places that, while connected to a new approach, feel perfectly in tune with who the band is and always has been. Rally Cry has the size and scope to match Arkells’ ambition and ever-growing audience that love the band for the uniquely raw energy that is all their own. 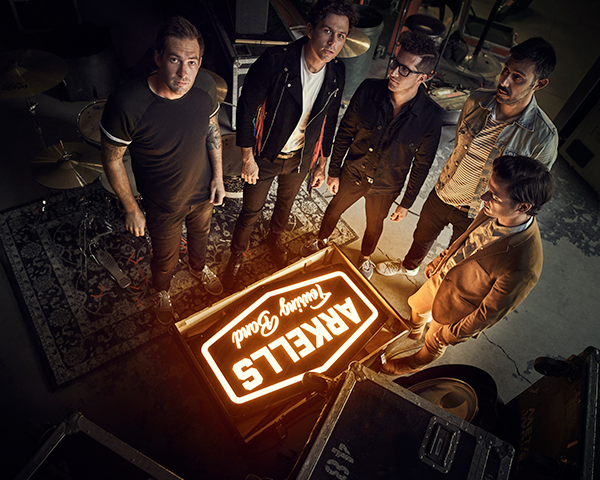 Arkells have remained ever-present, relentlessly touring in support of their most recent album, Morning Report, which was extended by the surprise release of “Knocking At The Door” – the 14-week #1 smash, which became the most played alt-rock song of the year. The album yielded festival stops from Coachella to Lollapalooza, an unexpected viral trip to the 2018 Olympics and their show-stopping, stadium-filled hometown show “The Rally,” in front of 24,000 fans this summer. This winter, Arkells will embark across Canada on an arena tour in support of Rally Cry with very special guest, Lord Huron.